Fifth Avenue above 42nd Street had just begun seeing the arrival of grand mansions in 1869. The former mayor, George Opdyke completed his sumptuous brownstone residence on the corner of 47th Street that year—later to be home to Jay Gould and his family. The block to the south of the Opdyke mansion contained a small skating pond. It would be another decade before the white marble St. Patrick’s Cathedral was completed at the corner of 50th Street and the great Egyptian Revival-style Croton Reservoir at 42nd Street was still a Sunday afternoon’s carriage drive uptown for most. But the completion of the new Grand Central Depot that year, just two blocks from Fifth Avenue, meant that scores of travelers would be arriving on 42nd Street with the need for accommodations. 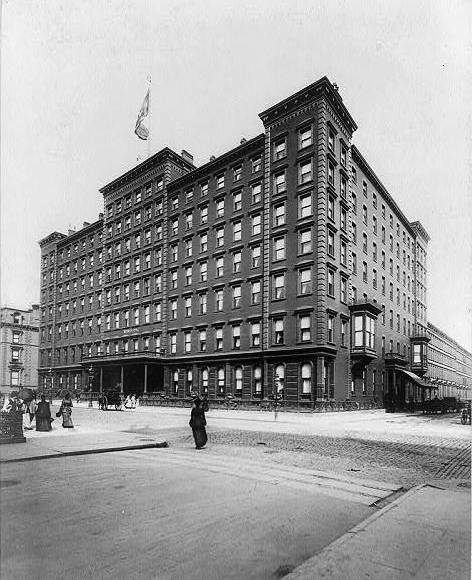 In 1871 construction began on the Windsor Hotel on Fifth Avenue where the little skating pond had been. Stretching the entire block from 46th to 47th Street it opened its doors two years later. Owner John T. Daly took advantage of the now-exclusive neighborhood to market his seven-story hotel to wealthy guests—both transient and permanent. Nay-sayers warned Daly that his new hotel was too far uptown to succeed; not to mention that it sat squarely within a residential neighborhood making it inconvenient to traveling businessmen or female visitors with shopping on their agendas. An early stereoscope view of the Main Dining Room shows the frescoed ceiling and sumptuous chandelier. Servants’ accommodations and restrooms were in the basement. The management was pleased with the precautions against fire. Throughout the mile and a quarter of hallways there were seven miles of water pipes. “On every floor are four water plugs in connection with the telegraph alarm, from which a floor could be flooded in case of fire in a few minutes. 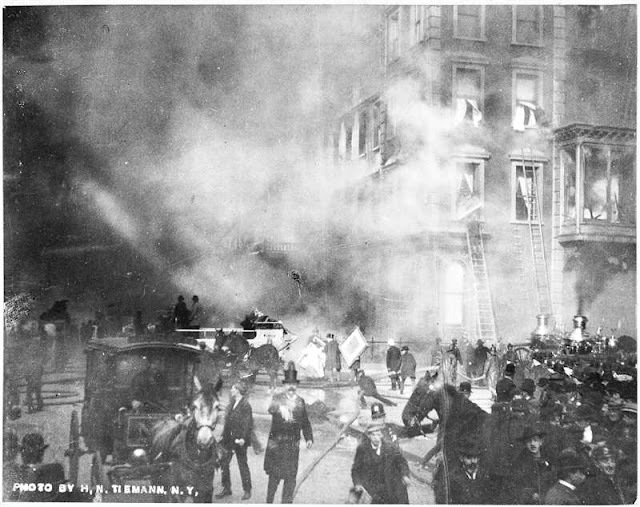 There are fire-escapes in the rear at both ends of the building,” reported The Times. The precautions, eventually, would not be enough. The new Windsor Hotel was a marvel in modern conveniences. There were 139 bathrooms and every suite had a private bath—a rare luxury in 1873. The suites also boasted “clothes presses and closets, and every room has a fireplace in it,” according to The Times. It was all reflected in the rent that Hawk & Wetherbee agreed to pay to Daly. The lease for the first ten years demanded payment of $75,000 per year—around $1.3 million today. Hawk & Wetherbee proved their expertise and the hotel that was too far uptown was a nearly-immediate success. For years New York’s financial wheelers and dealers had made the Fifth Avenue Hotel their unofficial headquarters. But little-by-little the Windsor became home to the late night meetings and plots. 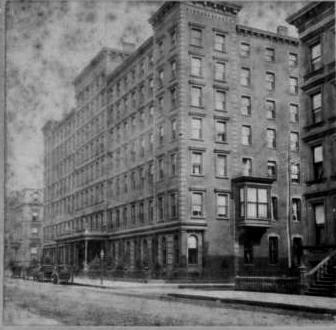 In 1880 Jay Gould had moved into the Opdyke mansion across 47th Street from the hotel and William H. Vanderbilt was living at the corner of 40th Street. In 1881 Andrew Carnegie shared a plush suite with his mother here. Carnegie was then around 35 years old and it was during a meeting in the hotel that year that he became partners with Henry Frick in the coke trade. On July 2, 1881 the man who skulked around in the hallways of the Windsor Hotel fired two bullets into the body of President James A. Garfield who died of his wounds eleven weeks later. Windsor employees felt that the man haunting its hallways in 1881 was unsound. Weeks later he would assassinate the President. 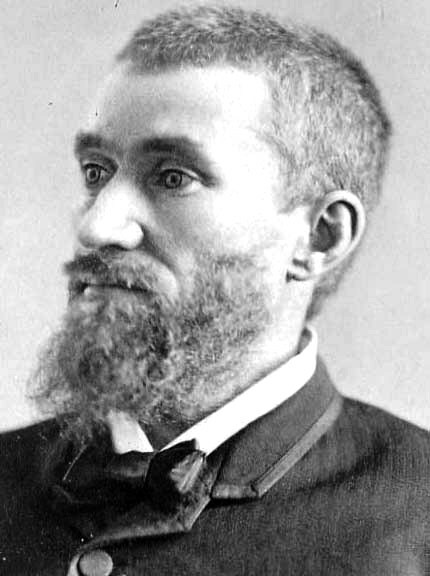 In 1884 a rumor was spread by Democrats that Jay Gould had used the Western Union telegraph to falsify the returns in the Cleveland-Blaine Presidential election. Gould got word that an angry mob was on its way uptown singing “We’ll hang Jay Gould to a sour apple tree.” He rushed across the street and hid out in rooms on the top floor of the Windsor for several days until things cooled down. 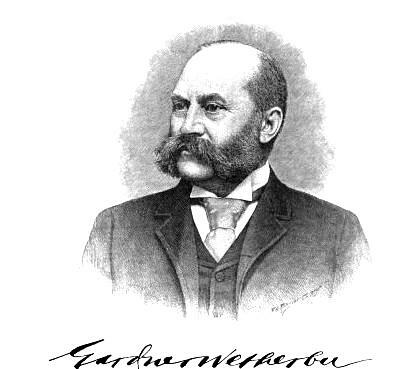 By now Samuel Hawk had died and his nephew, also named Samuel Hawk, had taken his place alongside Wetherbee in running the hotel. It became the choice of the world’s most important and most celebrated names. Opera diva Nelly Melba always stayed at the Windsor during her New York stays, as did soprano Adelina Patti. 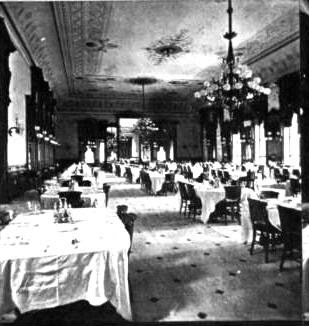 The Times noted in 1899 that Patti “always stopped there when in this city and occupied the same suite of rooms on the third floor looking out upon Forty-seventh Street. She had a private billiard table and was very fond of knocking the ivories about, as also was her second husband, Nicolini." Heads of state stayed in the Windsor. The Emperor of Brazil, Dom Pedro; President Diaz of Mexico; and Presidents McKinley and Arthur were guests here. On the afternoon of March 17, 1899 thousands of people crowded Fifth Avenue as the annual St. Patrick’s Day Parade filed past the Windsor Hotel. Around 3:00 a guest lit a cigar in an upstairs hallway and tossed the still-lit match which accidentally caught a curtain ablaze. Panicking, the man rushed out of the hotel without summoning help. The fire intensified with unbelievable speed, roaring up stairways and trapping guests in their rooms. The New-York Tribune the following day said “But the fact remains that the fire could scarcely have burned with more rapidity had the building been constructed with an eye to making one grand bonfire out of it.” The street below, moments before the scene of carefree celebration, was suddenly one of terror and horror. A maid who had just arrived to pick up one of the children, quietly whispered to Mrs. Duncan that the hotel was on fire. By maintaining calm, Mrs. Duncan managed to safely lead all of the children out onto the street. Others were not so lucky. Two more alarms were sounded. Firefighters, many of them still wearing their parade dress uniforms, hosed down the surrounding mansions to keep the fire from spreading. Included was the house of Helen Gould, who opened her parlor as a triage center. The Fellowes mansion at No. 570 Fifth Avenue had already begun burning. 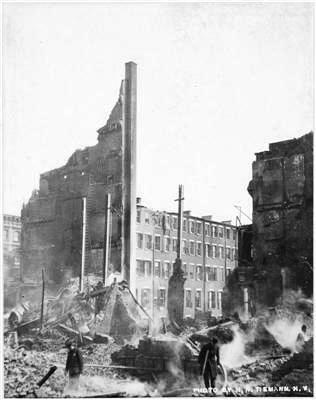 Around 4:00, just one hour after the insignificant match was lighted, the central section of the hotel fell in and twenty minutes later the 46th Street wall collapsed. It would be days before the ruins were cool enough to dig for human remains. 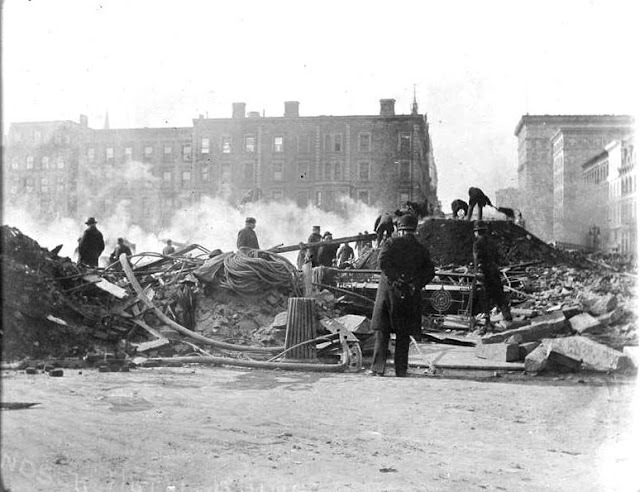 In the end at least 90 people were dead and for over a year the block-long plot of scarred ground—called by The New York Times “the dreary void”—was a reminder to the surrounding wealthy residents of the horrific catastrophe of St. Patrick’s Day 1899. On the site in 1901 rose the ebullient Windsor Arcade—a high-class, early 20th century version of the shopping mall named with respect to the grand and tragic hotel. Wow. A chunk of NYC history I knew nothing about. Thanks. 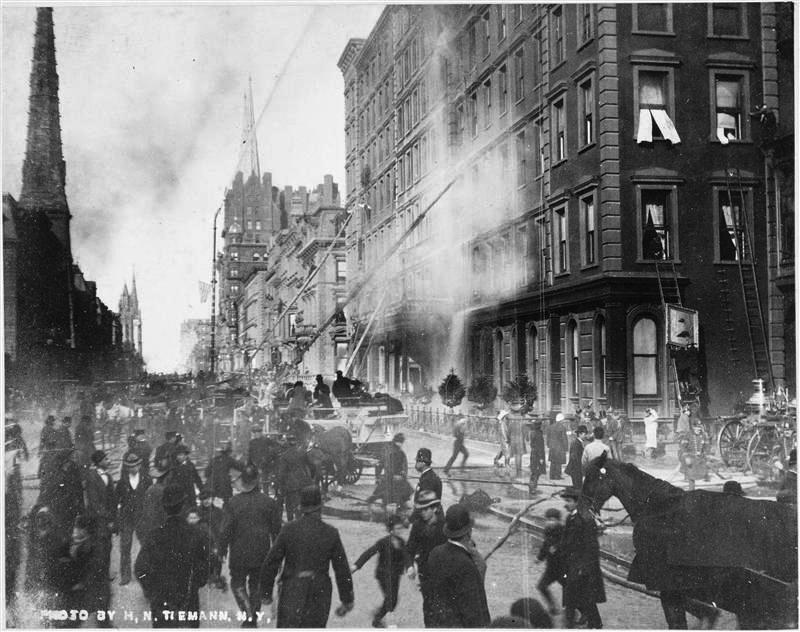 I remember reading about the Windsor fire and about how someone from the hotel attempted to cross the street to the fire alarm box, only to be rebuffed by a police officer, who, thinking the man was another drunken reveler, told him he couldn't cross until the parade had passed, supposedly delaying any response to the fire. Oh my, that sickens me even now. Thank you so much for publishing this, I am reading it ironically exactly 119 years after it's fact.